The Fixit Clinic "Brain Trust" works collectively on this Kitchenaid Mixer. These are normally one of our favorite items to see because 1) it's typically an easy fix and 2) repair parts are readily available. This person had valuable data on this USB thumb drive and we resoldered it so that she could retrieve the data. This Samsung tablet was wedged in a weird boot loop but Fixit Coach Lovejit Kharod reformatted the data partition and got it working again. We're happy to report that we're returning for an encore Fixit Clinic CCII (202) on April 1, where we hope to see many other things "spring" back to life in the spirit of the season. Hope to see you there; costume optional. But do follow the instructions below and register so we know you're coming. 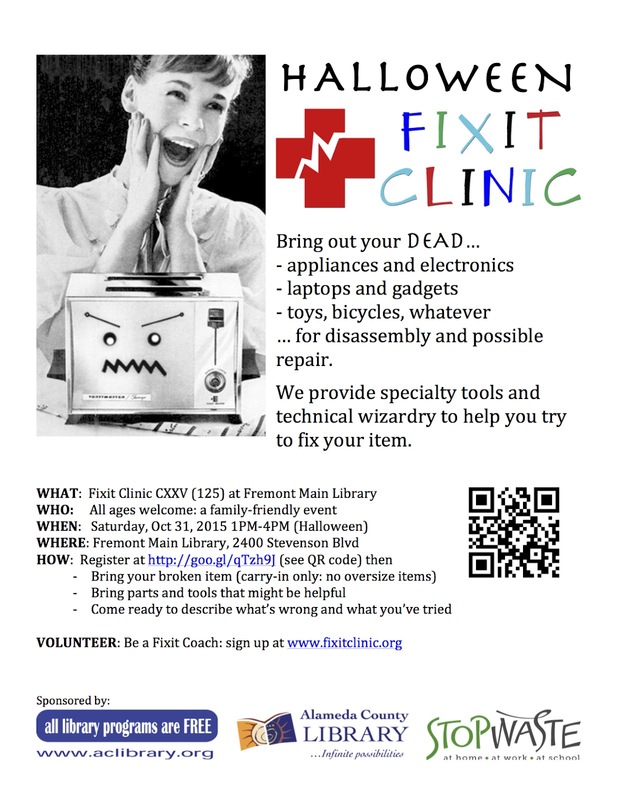 Returning to the Fremont Library: we look forward to seeing you at this Fixit Clinic! Celebrating repair through do-it-together hands-on STEM-oriented fix-n-learn community-based discovery and disassembly: you actively participate in the disassembly, troubleshooting, and repair of your item so that you leave fully empowered to share your new-found confidence and insight with your friends, neighbors, and the community at large. 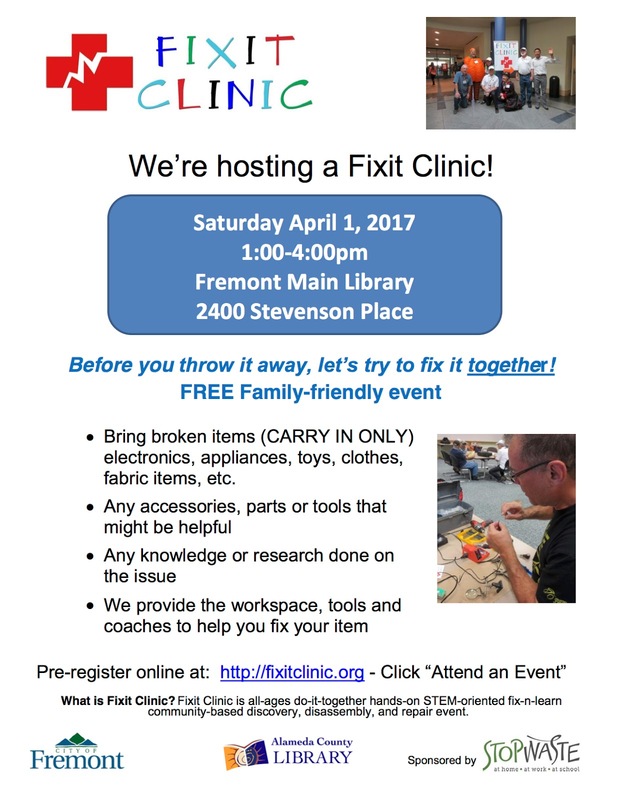 So bring your broken, non-functioning things -- electronics, appliances, computers, toys, sewing machines, bicycles, fabric items, etc.-- for assessment, disassembly, and possible repair. We'll provide workspace, specialty tools, and guidance to help you disassemble and troubleshoot your item. Whether we fix it or not, you'll learn more about how it was manufactured and how it worked. WHO: All ages welcome: a family-friendly event: accompanied children are heartily invited! Fixit Clinic at a Brewery? Fixit Clinics at the Second Change Beer Company. Are We Going Down The (TV) Tubes? Here's an excellent exposé on the CRT demanufacturing crisis. Among the many quotes of note: "The CRT mess, the industry says, has been caused by a fundamental refusal by society to acknowledge that recycling is an expensive proposition." and "...newer electronics are more difficult to recycle than CRTs, not easier." More evidence that repair, coupled with thoughtful manufacturing and consumption, is the most sustainable approach. As consumers: we need to take into consideration that if things we bring into our lives are not designed to be demanufactured there's a long-lasting cost to the environment. To paraphrase Patagonia's Director of Sustainability: "There are very few things that we consume [that is, that manufacturers make for us to consume] that don’t cost the environment more than what we can pay back. Making something last for a long time to reduce the need for replacement is an core environmental value." I wonder how Europe is handling the recycling of their CRTs?